Many of these white Europeans expressed themselves in similar ways. In particular, they felt ‘offended’. These migrants also felt ‘betrayed’. Betrayal implies some former obligation or contract that has been dishonoured. Betrayal implies belonging. In all these pieces, European migrants emphasise the contributions they have made, the taxes they have paid, and the benefits they didn’t claim. These migrants are ‘good migrants’. They are good for the British economy. They belong. They are self-mastering liberal subjects. They are white. These things not only intersect, but constitute one another. Whiteness is being invoked and produced in these narratives on hardworking taxpayers. Whiteness has always been about property: owning property and not being property; belonging to the nation and the nation belonging to you. To be properly white is to be a self-reliant, sovereign individual. Whiteness, class and belonging constitute one another in these narratives, as they have historically. Whiteness is verified by the charming pictures of these Europeans, as they walk in the countryside with their dogs or pose solemnly with their families. These images confirm and deepen our sense of righteous indignation. How dare the Home Office! Borders are not for white people. But none of these migrants really thought the Home Office would deport them. They did not mention the UK’s expansive detention estate nor their fear of workplace raids. Instead, they make clear that if the UK sends them one more rudely worded letter then they will simply up and leave, taking their skills and labour elsewhere. As Lars, a German aerospace executive, puts it: “if you were in the private sector and treated customers like this you would be sacked.”. Well quite, Lars. These articles are important as they speak in chorus: middle-class white Europeans are not really foreign. [i] This much is self-evident. They belong here with their families, paying taxes and walking their dogs. But which stories are not being told? Admittedly, my own research with deported ‘foreign criminals’ in Jamaica, many of who grew up in the UK, does make me feel particularly vexed by this white noise. But the wider point is that we cannot separate the issue of immigration control from questions of race and class. So how might we write differently about the UK’s border regime in the context of Brexit? How might we capture the ways in which race and class determine who faces the most violent forms of bordering? Detention and deportation are at the sharpest end of the UK’s immigration regime, and thus provide better sites for analysis than those ‘offensive letters’ received by respectable Europeans. Thousands of detainees are held in prison-like conditions while the UK tries to deport them. These prisons for the displaced and unwanted are good places to ‘think from’. While these accounts – from bankers, directors and neuroscientists – are remarkable for their stifling entitlement, there is something more at stake than the opportunity to ridicule privileged white folks, however cathartic that might be. These accounts reveal how borders become visible when they affect the wrong people, and this has everything to do with race and class. Nearly 29,000 non-citizens were detained under immigration powers in 2017. About half of these detainees were deported and another half were released in the UK, (although this varied significantly by nationality–for instance, 94% of Romanians were deported, while only around 30% of Indians, Pakistanis and Bangladeshis were). Clearly then the detention and deportation of Eastern European migrants, which is likely to increase when the UK leaves the European Union, is a product of class inequalities and the precarity and disposability of Eastern European labour. But what does this have to do with race? Are these Eastern Europeans not phenotypically white? Of course, ideas about race are sedimented and reflect colonial histories – the Romanian does not experience racism in the same ways as the black or Muslim person living in the UK – but we do need to pay attention to the ways in which race shifts and gets reconfigured through immigration control. Eastern Europeans alert us to this historical specificity. Eastern European migrants have been constructed as problems in different ways in the last decade. Firstly, there are simply ‘too many of them’–they are ‘stealing our jobs’ and ‘using public services’. But there has also been a focus on crime and criminality: on Romanians involved in cash-machine theft; on trafficking and prostitution; on homelessness, vagrancy and alcoholism; and on begging, with a particular focus on the Roma. These tropes on crime, vagrancy and prostitution resonate with older racist tropes deployed against other groups racialised as not properly white (e.g. Jews and the Irish). Stories about ‘hungry, knife-wielding Eastern Europeans’ poaching hundreds of swans from British canal, have appeared several times in the UK national press, perfectly symbolising the threat these migrants present to the British nation­–these were the queen’s birds no less. These discourses have profound consequences and underwrite acts of racist violence, by both the Home Office and emboldened street racists. In the wake of the Brexit vote, ‘Go Home’ was scrawled on one Polish cultural centre in West London, and signs saying ‘No More Polish Vermin’ were handed out in Cambridgeshire. Is this not a mandate for rounding up Romanian rough sleepers and indefinitely detaining petty Polish criminals? Popular racism, media discourse and immigration policy are all mutually imbricated, and while Eastern Europeans may be phenotypically white they are subject to intense forms of racialisation, both legally and discursively. As I have noted, then, most of the EU nationals who end up in detention do so after interactions with the criminal justice system. The Home Office has prioritised the removal of ‘foreign criminals’ and any non-citizen with a criminal record is likely to be detained while the Home Office tries to remove them. Crucially, this also affects Western and Northern European nationals. I have explained that some European nationals get detained, and most of these are Eastern European nationals. But what about the Western Europeans in detention? It is hard to imagine French, German, Dutch and Portuguese nationals being detained in immigration removal centres in the UK. Or rather, it is hard to imagine white Western Europeans being detained. Bail for Immigration Detainees (BiD) have unparalleled insight into the detained population. [v] Tom, a legal manager at BiD, explained to me that all the Western Europeans he had met in detention were either black or brown and had been detained after interacting with the criminal justice system. The Portuguese nationals detained have Brazilian or Angolan heritage; the French nationals have Algerian or West African parents; the Dutch nationals are the children of Somali refugees. This young man had lived in the UK since he was a small child, and yet after breaching a community order he found himself detained in an immigration removal centre for two months. The Home Office had no realistic chance of deporting him because he was Dutch and had acquired permanent residence. That means he had to present a ‘threat to public security’–more terrorism, armed robbery or murder than petty vandalism or smoking weed while black. But still the Home Office detained him, and even kept him in detention after he had successfully appealed his deportation. This was evident in the young Dutch man’s case; the police had written ‘Somali National’ on their paperwork, and then crossed it out in pen and written ‘Dutch’. The Home Office and the police were trying to deport him under Operation Nexus, an initiative ostensibly introduced to identify ‘high-harm’ criminals, but used to deport people on the basis of ‘non-convictions’. In Nexus cases, people are deported on the basis of arrests, charges that didn’t stick, and police intelligence (or hearsay). People can be ‘deported on suspicion’, and Operation Nexus cases often rely on the accusation of ‘gang affiliation’. In the case of the Dutch-Somali man, the police showed up to his immigration bail hearing and claimed that he was a ‘suspected gang member’. On that basis, they argued that he should remain in detention, indefinitely, under immigration powers, until he could be deported. It is not clear what constitutes ‘a gang’, but ‘serious youth violence’ is supposed to be central to the police definition. It is not clear, then, why 72% of those on the London gang’s matrix are black while only 27% of ‘serious youth violence’ in London is committed by black people. Of course, once this young Dutch man was in detention he very much ‘fit in’. 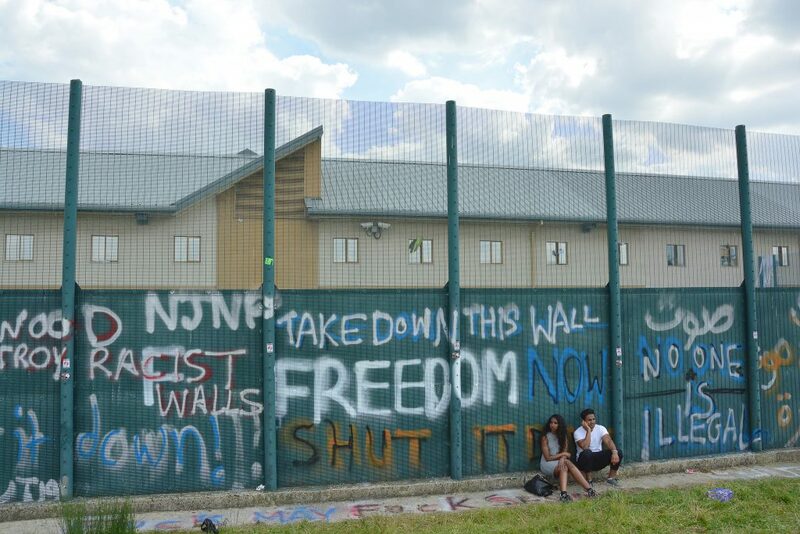 Detention centres are filled with black men who grew up in London, Manchester and Birmingham. The priority given to deporting ‘foreign criminals’ has seen the increased detention of long-settled non-citizens who moved to the UK as children. However, these men are not usually European nationals. They are the Jamaicans, Nigerians, Somalis, and Ghanaians who look, act, and feel as British as the guards who lock the doors behind them. These men remind us that it is non-EU nationals who will face the worst excesses of the renewed border violence in the wake of Brexit. Non-EU citizens have to navigate a profoundly punitive, draconian and ever-shifting immigration regime. They have to migrate via irregular routes – overstaying visas or claiming asylum. Non-EU citizens are turned into ‘illegal migrants’, and thus made vulnerable to profound exploitation from employers, spouses or those facilitating irregular migration. For most, secure status and British citizenship remain remote. Non-EU nationals represent over 80% of those detained each year, and it is non-EU nationals who are deported on charter flights, en masse, by cover of darkness, shackled in body restraints and disappeared on secretive flights. It is unclear what the consequences of Brexit will be, but millions of European nationals will lose rights. However, not all EU citizens will lose their rights equally and race and class are central to the social processes and state practices through which rights are distributed and people excluded. Further, if Brexit provides a mandate for more intensive, expansive and entrenched forms of bordering, then it will only deepen current inequalities among non-citizens. As such, it will be non-EU migrants, often from the UK’s former colonies, who will continue to suffer most from violent borders. There are many forms of racist expression in the UK, but the refrain ‘go back to your country’ seems essential to the white resentment, nativism and entitlement which define the nation. However, it is the Home Office which realises this refrain through its deportations. By paying attention to who actually gets ‘sent back to their country’, and through analysing the laws and discourses which produce different kinds of foreigners, we can examine how race is socially and legally constructed. This means staying alert to what is specific about our present without obscuring the deeply embedded and sedimented character of racist expression. This means recognising that the top three nationalities deported in 2017 were Romanian, Albanian and Polish migrants, without forgetting that most people detained are still black and brown. It means finding ways to analyse what is similar and different about the location of young black men accused of ‘gang affiliation’ and Romanian ‘rough-sleepers’, both of whom are detained and deported by the Home Office. If we care about the expansion and intensification of the border in the wake of Brexit, we need to talk more about race and class, and less about taxpaying, hardworking, blonde-haired, blue-eyed bankers who feel betrayed and offended at receiving letters. The stories we tell matter. And so I will end with a different one. I met Darel in Jamaica in September 2016. He had been deported a few days earlier on a charter flight with 41 other Jamaican nationals. Darel, aged 31, had lived in London since he was seven. He has six children in London, and was primary carer for four of them. When I met him in Jamaica, he was disoriented and frightened. He had no money, no support network, and spent his days inside on his phone speaking with his children. Darel had never been to prison, but he had received three convictions for possession of marijuana. He was deported under Operation Nexus after the police claimed he was a ‘suspected gang member’. Darel was not a member of any gang he just grew up on an estate, smoked weed and was black. On this basis, he was exiled from his children, his partner, his family, his friends, and his home in the world. Darel did not write to the Guardian. He did not understand the law and was not entitled to legal aid. He was subject to the most extraordinary form of state power, and yet his story was not news. It is this vulnerability to state power, and the illegibility and invisibility of Darel’s suffering, that alerts us to the mechanics of race and class in the operation of the border. Brexit might mean some bureaucratic inconvenience for white middle-class Europeans. But the real danger is that it might mean more Darels. More people illegalised, criminalised, detained and exiled in these violently anti-immigrant times. For those concerned about class politics (beyond white nativism) and the politics of anti-racism (beyond ethnic particularity), there could not be more at stake. Luke de Noronha is a PhD student in Anthropology at Oxford and an Associate Lecturer at Birkbeck College, University of London. His doctoral research examines the deportation of ex-offenders from the UK to Jamaica, exploring the lives of deportees in Jamaica as well as their friends and families who remain in the UK. [i] It is instructive to remember that the European Economic Community was founded not by nation-states but by imperial states: the negotiations for integration were predicated on the very idea of “bringing Africa as a dowry to Europe”. [ii] Ten people committed suicide in detention in 2017, and several of these were Eastern European. [iii] The Home Office defined rough-sleepers as in breach of their treaty rights, even when they were working, which conveniently provided local government with a means of disappearing a significant proportion of the burgeoning homeless. With the support of homelessness charities, the Home Office launched Operation Adoze and Gopik and detained hundreds of homeless EU nationals through these enforcement operations. The policy was ruled unlawful in late 2017. [v] Tom from BiD told me that last year they opened 2,300 files and spoke with many more detainees in legal surgeries (he estimated they interact substantively with about 20% of those detained).